A set of hidden mechanical arms automatically opens this bi-parting wooden driveway gate. 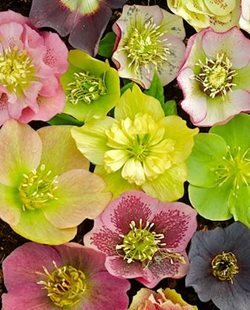 Since it is likely the first thing guests will see and interact with when arriving at your home your driveway gate must be functional and beautiful. 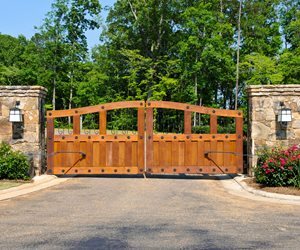 At first choosing a gate for your driveway may seem overwhelming, but it really boils down to five choices. 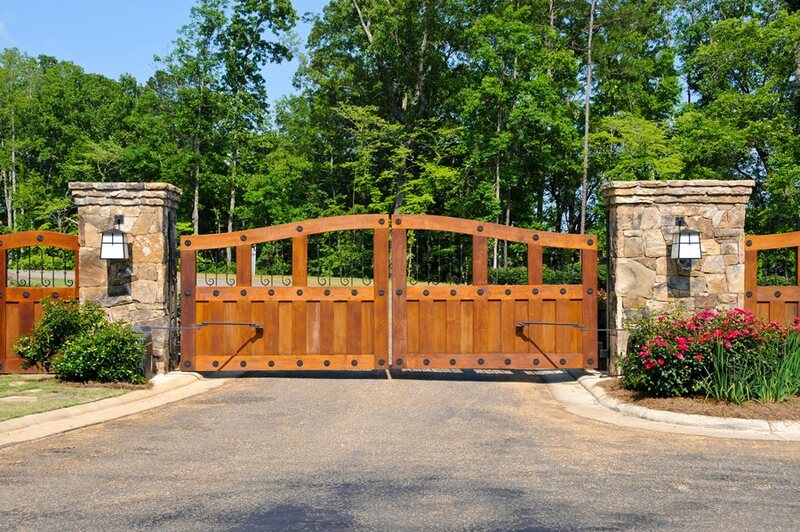 It is important to match the architecture of your home when selecting a gate for your driveway. 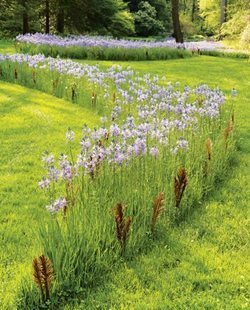 Gates with curved tops and intricate metal work tend to be more formal, while gates with flat tops and simple designs feel more informal. 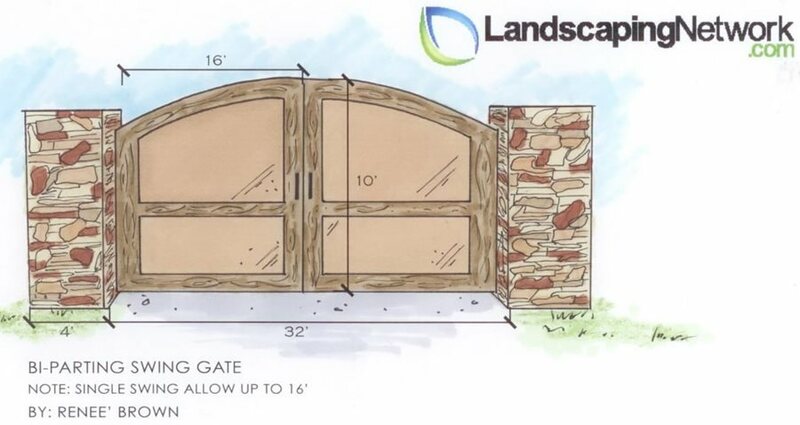 A drawing showing the typical dimensions of a bi-parting driveway gate. 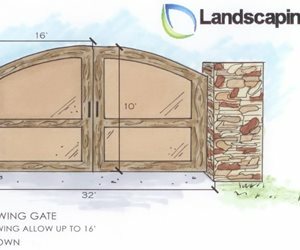 A drawing showing the dimensions of a sliding driveway gate. "Cantilever gates are sliding gates usually for vehicles. 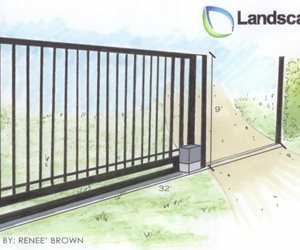 The special sliding design of a cantilever gate allows the movement of the gate to slide immediately behind and parallel to a chain link fence line. These gates are advantageous for tight spaces where a swing gate has no room to open fully. 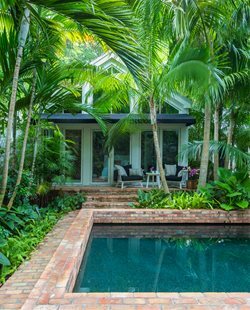 It is also common to use cantilever slide gates for larger gateways because they are actually easier to open and close. Slide gates are also better to automate in my opinion, as it is easier to install safety equipment on a gate which slides back and forth within about 1 foot of space versus a larger swing gate with at least 180 degrees of swing," says Chad Hoover of Hoover Fence.